A lip / cheek stain is a liquid formula product that does exactly what it's supposed to do, which is to stain. I really like lip & cheek stains, as they last a long time and you don't look like you are wearing any make up because they dry completely matte with no shimmer, glitter or gloss to them. I don't use them as often as I used to as I discovered lots of lovely new blushes recently, but with the sunshine approaching I think these are great products for the summer, as with a dewy liquid foundation, they look very pretty and natural. A cheek stain is for you if you like the idea of a cream blush, dislike the powdery texture and want a fresh looking blush that lasts ALL DAY. A lip stain is for you if you hate wearing lipstick as you can't stand the texture or want something to last ALL DAY on your lips. I currently have four in my collection, and wanted to share my thoughts on them. BODY SHOP - LIP & CHEEK STAIN (£9.50 - 8ml): This was actually the first stain I tried about 5 years ago and I went through about 20 tubes of it. It has a doe foot applicator and a watery consistency. The colour is like a Rose berry toned red. I used to wear it on my lips and my cheeks at the same time. It doesn't have a scent, overall a great product but I went through them TOO quickly. Omg, I have just checked the website and it's now also available in shimmering coral and bronze glimmer! Would I re purchase? Yes, but only in different shades as I am a bit bored of the colour I own. BENEFIT - BENETINT (£23.50 - 12.5ml): I discovered this soon after I discovered the Body Shop one, I have only ever purchased 2 bottles of this. It looks a bit like a nail varnish bottle, with a brush applicator. I loved this at first because of the rose scent, and because of the pink berry red colour. But, I actually find it hard to use as it's SO watery, as soon as you put it on your cheeks, it drips down. You have to work really quickly or your left with dodgy patches. Benefit also have 'Posey Tint' which is a thicker pinkified version of this, which I have never tried. BOURJOIS - ROUGE HI-TECH (£7.29 - 8.5ml): I first purchased one of these about 2 years ago, and have recently been reunited with another colour. These are much thicker in consistency than the others which give them better control. It has a does foot applicator making it easy for application. 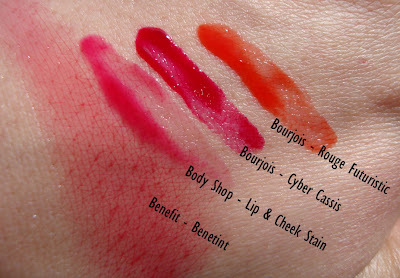 The Bourjois stains are actually marketed for your lips, but they are certainly safe to use on your cheeks. The colours are also more vivid looking and there is a wide variety of colours available. The most striking one for me is the coral (82 -Rouge Futuriste) as it's hard to find a stain in the warm toned family. 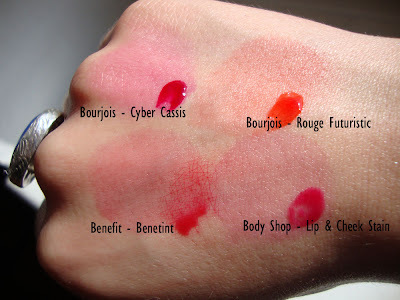 The berry red (86 - Cyber cassis) looks like a dupe for the Benetint and Bodyshop stains, it looks more pigmented upon initial swatch, but once blended, it's from the same family. See swatches below, you can see that the 'Bene Tint' didn't even behave for the picture, drip drip drip all the way down. Once blended, they all look very wearable, you can build the colour up to as dark or as sheer as you want. Here are the swatches again with the initial swatches to show you how sheer yet buildable they are. I have also tried Smashbox O-gel, which I didn't really like. I am gutted I never purchased Mac's 'Just a pinch' LE gel blush as I think I would have got a lot of use out of it. What do you think of lip & cheek stains? Any favourites? Disclaimer: I received one of the Bourjois products for review purposes, I was not paid for this post & I am not affiliated with any of the brands mentioned. This is my honest opinion as always. I can't make them work for me cause I use a Mineral foundation. Do you have any tips for this? I also went through about 20 tubes of the body shop one. Its just such a good color but it dies run out fast! I tried the bronze bodyshop one that came out a year ago and that was ok (the shimmer kindof split from the base color) but i think they may have change the formula now. Thanks for sharing this. I haven't tried cheeks stain yet. The one from the Body Shop looks gorgeous! i am a little bit weary of cheek stains because i'm always worried i'll look like i smudged marker on my face. what brush do you use to apply them? oh, and i have an idea that might work for HOLLYWOOD because i use mineral foundation. whenever i need to use a product that requires a liquid foundation underneath, i tend to mix my mineral powder with a moisturizer and apply it as a tinted moisturizer instead of in its powder form. I don't know if this will work with a stain though, since i've never used one before, but it's worth a go. I only own Benetint and totally agree with you about working fast with it. 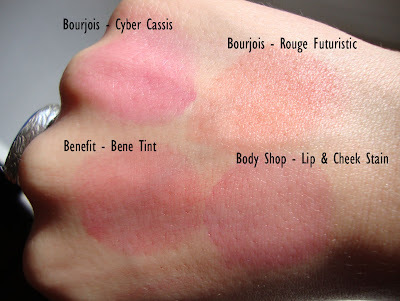 From the swatches I think you have convinced me to buy one of the Bourjois tints. I can honestly say I've never been disappointed in bourjois products. They have lots of pigment and they have incredible mascara!!! Back to my point I've tried they're stain the color is rich and really pretty! I'm hesitant although about the bodyshop products they always feel cheap and ruin my skin. I would love to get my hands on some of those Bourjois stains. They look devine! how do you go about applying let alone "evenly" applying a cheek stain? I also have tarte's cheekstain which I don't really like as it is tacky. I love love love Posie Tint - it is my go-to blush. I also have 2 lip and cheek stains from Stila which are really pretty. Stains are probably my favorite blush type as they are so natural. @vadilucia I just dab it on my cheek area and blend with my fingers right away, easy once you get used to it! I agree the Bourjois ones are good. Well so I thought until I tried Beauté Liqui-Gel stains. I wasn't sure if they would live up to the hype (and the price!) but they completely do. I love the consistency of them (not at all runny, more slightly gel like), and they blend beautifully. I have found that they also have much better staying power than Benetint and Bourjois. What I love too is that there's a choice of colours (I'm the colour of a ghost but they do shades that suit different facial skin tones too), and I find that I use them more on my lips and not just my cheeks, which I've tended to do with the others. So , all in all, I think I'm getting my money's worth from my little investment. Better than Bourjois? I havent heard of Beauté before, where do you get it? there is carmine in the benetint so never buy it! carmine is made of crushed insects! check wikipedia and other sites! love the bourjois ones! i think these are discontined, are these?